Two more RyuSoulgers make themselves known, just as another Minusaur appears with a personal connection to the team. This was a ok-good episode. Proper introduction to Towa and Bamba and they're the typical "mission is more important than saving lives" kind of guys. So obnoxious anti-heroes (more so with Towa as he isn't afraid of insulting others or the fact he's willing to sacrifice a human life to stop a Minosaur). Despite being the youngest, Towa is the more authority figure/voice of the bro duo. Bamba is a bit quite-ish, seems like a actions speaking louder than words kinda guy. Really good character development/moments with Ui. Although I feel like this was too quick in the series for this to happen. I would've thought this kind of situation would be later on (closer to the half way point). While i liked the development for Ui, I think Asuna considering Ui important as a friend was really forced IMO. The RyuSoulgers have only known her for 1 episode (about 1-2 days in series), so unless Asuna has a very trusting personality, it's quite a reach because the plot said so. Mech fight was ok. It didn't feel as grand or exciting as the first two episodes mech fight scenes but it was an ok-simple fight. Overall, enjoyable ok-good episode IMO. Last edited by KRWolfblade; 04-01-2019 at 05:43 AM.. So the brothers are being dicks as of the moment, as expected. I thought they might end up facing a minusaur that they couldn't beat by themselves and needed to be rescued by the other three before they come around but from the preview it seems Towa might change his mind. I'm thinking Bamba might be harder to convince. I'm still noticing that they're putting more premium on the mech battle than the ground battle. I hope down the line they'll be able to balance the two better. I still prefer ground battles even with how good the mech battles can get. What Tow and Bamba have done until now ? Kill every minusaur host they found ? Bamba is more stoic about this but Touwa now is just a psycho. I think they should have focus on Melto OR Ui OR the brothers this episode and not all once. Ah, and it's time for Toei to change the "turned to stone" filter because it has not aged well. Honestly I can't remember last time I saw a decent "turn to stone" effect in toku. 3 episodes in and things seem to be safe and standard. I know people say to "just stick to it, It'll get better", but I'm finding it hard when it just seems to be standard. LuPat, even though it's not one of my favourites, made it feel fresh and different in its first few episodes. Okay, I'm starting to think I might be cutting this show a bit too much slack. I'll just preface this by mentioning I am having my fun with Ryusoulger. I'm not actively upset the way this post is probably going to come off. It's just a show, right? But it's a show where I have almost nothing nice to say about its quality after nearly a month. The lack of Kamihoriuchi here must've pushed me over the edge or something, but I'm feeling pretty nasty towards this episode even thought it was by far the best written one yet. There's an actual structure to the plot, Melto gets a bite-sized character arc (which is all I'm asking for this early), and it's about Ui, which automatically makes it way better. Mostly because Ui is the singular character in the entire show I'm actually endeared to so far. You know who I'm especially not endeared to? The trigger-happy jerks who immediately jumped to murdering her as a solution to the monster of the week. I mean, what the f***? 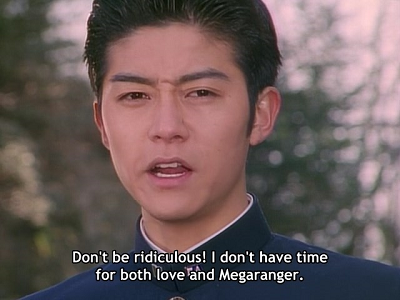 It's bad enough Towa and Bamba mostly wasted screentime in Super Sentai Strongest Battle, but their first appearance in their own show has me hating their guts. I figured they were going to be the cool, competent members of the team, but inadvertently driving a teenage girl to attempt suicide is about as incompetent as you can be when your job is protecting people. I'm just not sure what's going on with this show or my feelings towards it. I should be happy there's some friction between the team members, because conflict spices the show up, but even though it doesn't exactly seem forced, something about the way this and almost everything else has been executed irks me. If Towa and Bamba are so happy to kill Ui here, what does that say about what they've been doing off-screen? What the heck is up with the Kishiryu running away? Why did they do that? Do they like living in caves? Did Tyramigo just really want to see a zoo? When did they run away? Because we never even saw that part. They were dramatically posing with everyone at the end of the premiere and then the very first seconds of the next episode they're just gone. Why did that need to be a plot point at all? Does this show have cold opens or not? Because it's done the opening three different ways in as many episodes. I could go on like this forever. I'm not sure how much of that is nitpicking (except the bit about the opening, which is obviously not a big deal) or what, but all I can think when I watch this show is how I'd rather see them handling things then the way they are. I think the ending theme is literally the only thing in Ryusoulger that I'm completely satisfied with. I'm trying to stay upbeat about it, but if the quality keeps refusing to improve like this for much longer, it's going to become a problem. I was thinking this is a ui and blue focus episode. He shows his negative side and ui insecurities respectively, but we're introduced to 2 "asshles" team members. It doesn't help that green is doing that stereotypical he's better than you while looking down on you expressions. Yeah, it's gonna be really difficult to warm up to Green and Black after this and it's a problem I have with a lot of redemption arcs in Toku. They were grinning with glee at the prospect of ending their problems by killing someone; that's gonna take some damn good explanation before I feel comfortable with them.